Well this is a new one for me. High West Distillery is a relatively new outfit from Utah – and is the first legal distillery to open in that state. It seems that while they’ve started distilling their own product, none of it has aged enough for their standards, so Rendezvous was created from two whiskeys distilled in Kentucky: a 6-year old rye and a 16-year old rye. This seems like a decent way to solve the problem of having to wait for the barrels to do their work before having anything to sell – this way High West has product on the shelves, paving the way for their own stuff. It also doesn’t hurt that their blend has won some accolades either. Let’s see what it’s like. Hmm. Rendezvous crosses just about every line of taste I’ve outlined in the past year plus on this blog. 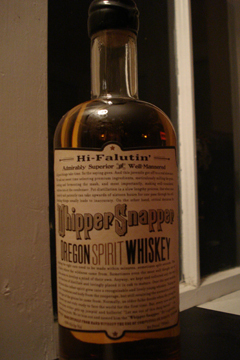 Two large paragraphs of text on the back, faux-aged type, Old-West rustic style bottle, and questionable claims to an authenticity-granting history. Some quick research shows that High West ran into some trouble among the bourbon community for not being clearer that Rendezvous was not distilled, but only blended, by High West itself. I’m not sure how important this ultimately is so long as the end-product is good – but it is odd to try so hard with the packaging to grasp at historical and narrative authenticity while remaining a little shady on an actual issue of authenticity. To the nose I get a sensation of pancakes and maples syrup as well as some citrus/orange. The mouth feel is pretty luxurious on this and this comes across right away. Over it all, there’s a bit of smoke lingering around. There’s a creamy taste to this that moves into a strong rye flavor with a bit of a tart bite to it at the end. The finish is reasonably long and quite spicy, which is a nice touch. As I said before, Rendezvous goes against all my sensibilities when it comes to American whiskey packaging – but this is one of the better whiskeys I’ve tasted lately. The product itself is definitely impressive and I’ll come back to this one for sure. Let’s just hope they revamp their angle when it comes to presentation. The other night I was on my way to my girlfriend’s apartment after work and decided to pick up a bottle of wine for dinner. I stopped into fairly large (for Brooklyn) liquor store in her neighborhood and, of course, had to spend a bit of time in the bourbon/American whiskey section. I didn’t intend to get any whiskies, but I picked up Corner Creek Reserve without much forethought. It was in a reasonable price range and is not something that you see every day, so I figured I’d give it a try. I left with it and an inexpensive bottle of wine. You can see where my alcoholic priorities lie. The thing that most people will notice about Corner Creek Reserve is that it comes in a green-tinted wine bottle. That alone will make it stand out on most everyday liquor store bourbon shelves, but it also seems to be a part of a larger positioning play by the company, which I’ll get to in a moment. The front label is dark blue ink on unbleached paper with a fine, red border line. It is dominated by a print of what we must assume is the eponymous creek, below which is the name and basic aging and production information. The font is a rustic serif set in a very matter-of-fact style, giving a sense of openness to the packaging that contrasts the cluttered nostalgia of many bourbon bottles. The copy on the back tries to tie what Corner Creek is doing to the selection of fine wines: “In the tradition of the great wine importers, we … search for the the elusive few great barrels of prime aged American whiskey, and offer it to you in this limited bottling.” This is a clever tactic, likely meant to draw in curious (and apparently snooty) oenophiles who might be put off by the usual peculiarities of bourbon packaging. This is where CC’s product positioning becomes clear, they have created a bottle that looks and appeals to wine drinkers and noticably eschews the common bourbon tropes in favor of common wine tropes. They’ve gone for classy rustic instead of the bourbon favorite trio of old men, old recipes, and old times. Corner Creek Reserve does not have much of a nose to it. It feels tight and pretty locked-up in comparison with its usually more bombastic bretheren. You can search, but really all you’ll find is a bland sweetness with maybe a hint of ash. Things open up a bit more on the palate. I got pine, some distant smoke, along with the usual corn/caramel. The finish is largely smooth but lingers a bit with a smooth creaminess. One thing I can say about this over all is that it is very smooth. It is more like Basil Hayden’s in this way, but without as much complexity. Goes down easy despite the 88 proof. 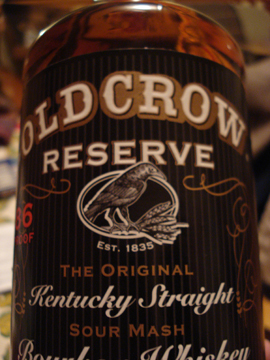 I have to hand it to Corner Creek, they’ve created the perfect bourbon to capture wine drinkers. Everything from the presentation to the liquor itself seem tailor made to draw someone away from their cabernets and merlots. It’s a good, smooth bourbon that won’t get you too excited, but which I’ll probably bring out for folks who like a milder drink or are nervous about leaving their oenophile ways. The selection of Kentucky Vintage was not the result of the most pointed recommendation process. I had never read or heard anything about it and it was recommended to me at LeNell’s only after it became clear that I had already exhausted the my guide’s first few rounds of suggestions. That’s what this blog is all about though, right? Kentucky Vintage comes to us from the folks who make Johnny Drum, Rowan’s Creek, and a few other familiars on liquor store shelves. Judging by their website, Kentucky Bourbon Distillers has a broad and slightly disorganized product range in a variety directions – all the more for us to taste, I suppose. 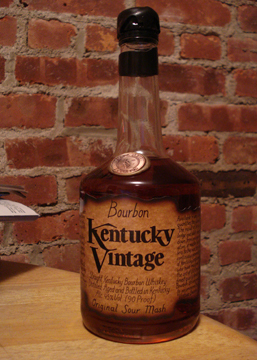 The labeling on Kentucky Vintage seems to be a distillation of everything I complain about in bourbon labels: faux-aged, faux-burnt edges, Comic Sans-esque lettering, and (three!) long winded descriptions. To top it off, they’ve dipped the plastic screw-top in wax. Yet, to their credit, it seems their hand-numbering is legit, as is their medallion pressed into wax on the front. The bourbon is small batch, 90 proof, and of an age only described as “long beyond that of any other bourbon,” hmmm. This doesn’t mean anything other than it’s older than four years, legally, but it would be nice to imply a range from which they’ve selected. To the nose Kentucky Vintage is pleasant, if subdued. Dominated largely by char and a saltiness, there are also notes of sweet pears and oak. It is neither rough nor complex, but hits a middle ground that just misses the “boring” range and lands in “pleasant”. On tasting KV’s dominant sensation is saltiness start to finish. Further inspection reveals that there isn’t too much more than that except corn and a hint of char in the middle. This really tastes much greener than something aged “long beyond that of any other bourbon” should taste. In a blind tasting, I’d be surprised if this were even four years. I was hoping that the clumsy presentation of Kentucky Vintage reflected an honest concentration on the bourbon itself – as it should be – but I was ultimately disappointed. Judging by the range of bourbon sold by Kentucky Bourbon Distillers, they would do well to take a hard look at some of their expressions. While the rest of my borough is out partying, I’ve taken a break to bring a new whiskey into my arsenal. Shine On Georgia Moon is something that’s caught my eye on the shelf every time I visit my local liquor store, so instead of venturing down to Red Hook to see my usual pushers at LeNell’s I opted to give SOGM a try. Shine On Georgia Moon is bottled and positioned for one purpose and one purpose only: to hammer home the idea that it is moonshine. From the name, to the mason jar, to the irregular typeface on the shopping-bag-paper label, this liquor is anything but subtle. Thankfully they realize that they are so unapologetically forward in their visual presentation that they didn’t find the need to add a hokey little narrative about some old-timey man and his still out in the back woods of Georgia (or Kentucky as is the case here). Beyond these obvious points, there is one message that seems particularly distictive to this brand – they proult declare that their product is “less than 30 days old” right on the front label. This is a clear response to the often fetishistic focus on a whiskey’s age that we see in other brands. SOGM seems to be trying to make the “freshness” of the product a selling point…not a crazy approach in the era of local food and farmers’ markets. If you take the cheap bottling and quick time to market implied in the “less than 30 days old” tag line, and place these two qualities next to the $13+ price point, what you see is some damn shrewed marketing. The Johnson Distilling Company has taken the market’s obsession with notions of “authenticity” and manufactured unpretentiousness and turned it into a cheap-to-make, mid-market brand. Bravo. Shine On Georgia Moon is no subtler to the nose than its bottling is to the eye. Before even getting to the nose however, one must struggle to pour the whiskey out of the mason jar itself – not an easy task to complete neatly. Once in the glass, SOGM definitely smells like whiskey, but very green whiskey. The dominant scent is (naturally) corn, but it really smells like the mash itself, unaged, unmellowed. On the palate, SOGM is equally young. It moves quickly through its seasons: starting with a burst of corn, dropping into the sensation of boiled mash, then disappearing as quickly as it came leaving only a slight remembrance in the clean finish that something had passed this way. There seem few better ways to describe it than simply as ‘fast’. 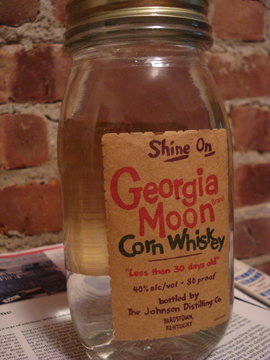 I would probably never find myself settling down with a glass of neat Georgia Moon any day soon, but that doesn’t mean there aren’t good uses for a green whiskey such as this. For instance, I can imagine with a little simple syrup and mint this would make a fine julep; or perhaps replace the mint with a wedge of lime and the simple syrup for cane syrup for a variation on Ti’punch. In fact, SOGM reminds me more of a rhum agricole than a bourbon or any other American whiskey – so it might be best to treat it as such. After last week’s screed against nostalgia-based marketing, I chose a bourbon that relies less on grandfather-distillers of yore and focuses more on stuff their grandchildren are making today. Knob Creek’s marketing material on the bottle is refreshingly contemporary, while not completely eschewing references to less mechanized times. They use sans-serif fonts, irregular angles, and intersecting text while making nod to the past with the wax-sealed top and the singular serrated label edge. The bottle text does not speak of ancient recipes or generations old practices, rather it focus on the care that goes into the product itself: 9-year aging, small batch, straight bourbon. The one deceiving element, however, is the fact that this presentation would have you believe that Knob Creek is a small-time craft distiller, when in fact it’s an arm of Jim Beam and created on the same stills with similar methods. Opening the bottle releases a sweet whiff of post-rain freshness, but the real fireworks start after it’s poured. The nose definitely tells you this is an assertive drink – definitely 100 proof: warm, wet asphalt, oak, hard candy. Knob Creek is even less subtle on the palate. It comes in swinging with sweetness and and almost-citrusy tartness. This is followed by a fruity, meaty depth you can sink your teeth into. It finishes long and slow with spice mellowing into a lingering oak. This is a very assertive drink and equally enjoyable. The extra few years in the barrel seem to have done a lot of good. 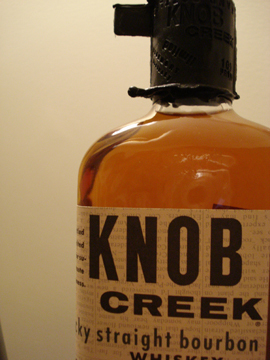 Knob Creek is perhaps the first bourbon I’ve tasted in the course of this blog that could go head-to-head with many single malt scotches as far as complexity and meatiness go.